Most internships start slow and build up. Not all companies have a structured training program or welcome receptions for new interns — so be ready to roll up your sleeves and find opportunities to contribute. Also don’t say NO to mundane tasks. You weren’t provided the opportunity to learn to be able to say “no.” Staff have to do these tasks with or without you. 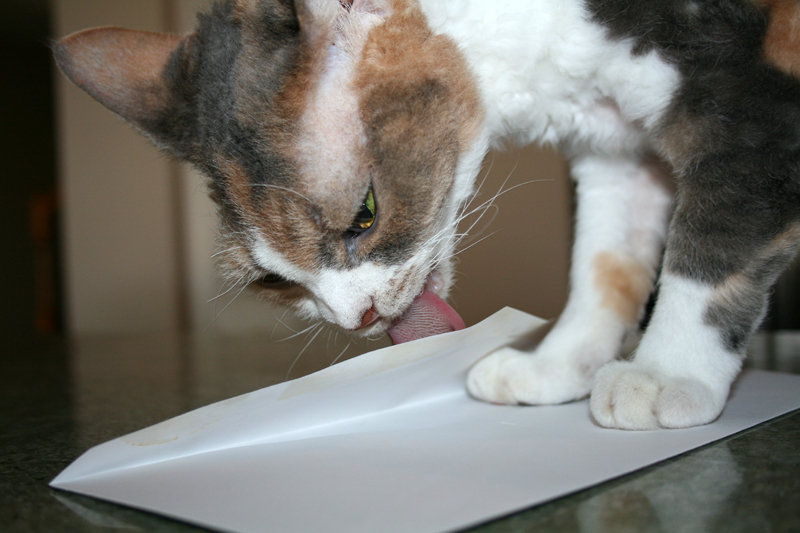 Think having a bachelor’s in journalism, international affairs, marketing, public administration, or business qualifies you to lick envelopes? No, but having a tongue does. Your main objective should be to make yourself invaluable or at least make your co-workers’ work lives a little better. You might be overqualified for most things you do, but do it like your job depends on it. Once you’ve proven yourself worthy on the crap tasks, offer to do some other things that your co-workers might not want to do or have the time to do, such as cover a court case, write a letter, or research new membership software. They’ll be grateful and you will endear yourself to them. Many times the invaluable intern gets offered a job. Whatever your work is — filing papers, making copies, picking up Starbucks or something (hopefully) more substantial — do it efficiently and do it well. Your work, no matter how trivial it may seem to you, is important and much-needed. One of the biggest mistakes I see interns make is that they sometimes don’t take advantage of the opportunities sitting right in front of them. If you sit back and wait for something to happen, nothing will. You need to be proactive, by making the most of your internship to get the most out of it. I know how hard it is to wake up (trust me – I’m not a morning person), commute, and jump right into doing something as boring as filing, making copies, or whatever diminutive task your boss might ask you to do, but it’s better than your boss realizing that you’re sitting at your desk twiddling your thumbs or hiding in the bathroom using your phone. Don’t worry, we will get to the phone in a minute. If you have one of those internships that doesn’t have anything for you to do, then make work for yourself. Read up on industry trends, organize the office supply room, or familiarize yourself with the company’s current projects. Volunteer to do something you think is needed, help a coworker, or ask for more responsibilities. There’s always something to do, I promise. You could even volunteer yourself to do something that doesn’t look all that enticing, like cleaning the kitchen or fixing-up that messy closet — so that when an assignment finally does come along, you’re fully prepared to tackle it. Also – everyone will be super excited if they can now locate a pen with ease in the supply room! Your supervisor is likely busy and won’t be able to give you tasks for every second of the day. Sitting around and waiting for them to give you something to do isn’t a good habit to get into. Still at a loss for something to do? Show that you’re taking initiative by coming up with an idea and pitching it to your boss, if he/she hasn’t given you an assignment! Always show your willingness to put in the extra work. 13. Life Isn’t all Rainbows & Roses! Wahh wahh wahh. Whining is not an acceptable response to any request, no matter how annoying it may be. Complete all your work with a smile, even if you’re screaming on the inside. Remember, it’s an opportunity — not a chore. Cleaning out a supply closet, creating an endless stream of spreadsheets, following directions from an impolite superior, designing a brochure in a way you feel isn’t the best, or answering phones isn’t always fun. We know that. We get it. Unfortunately, this is the way the real world works. Most of the time it isn’t fun. We don’t all get to work at Disney World and even then, I bet those employees still face the same issues that you have. Life isn’t fair. It isn’t full of rainbows and roses and you are not a special little snowflake. You are there to learn about a certain industry and you can decide after the internship if that particular environment is right for you but while there, you work. You make a good impression. You smile. You do your job. You do not complain or whine. You certainly, do not complain audibly, while at work! One thing you’ll need to learn quickly when you start working with other professionals is to not take things personally. Just because there was a mistake on something you did doesn’t mean the person who’s calling it out hates you. Constructive criticism is all part of the learning process, and not everyone will be polite about it. Don’t tolerate bullying or disrespect, but do grow a thick skin — that way you’ll learn from your mistakes instead of repeating them. You’ll get better at this over time as you develop a tougher skin. If someone tells you something that upsets you, do your best to hold it together until you’re alone. Crying in front of your coworkers is a sure way to show you can’t handle stressful situations. Never let them see you cry. Repeat this with me: Never let them see you cry! 12. Ingenuity Goes a Long Way! It’s a given you’ll have questions in your new role, but instead of bombarding your boss every 15 minutes, first take a moment to think about whether there’s any way you can find the answers on your own. Many employers are massive fans of throwing interns in at the deep end in order to see if they sink or swim on their own. This doesn’t mean they are rooting against you. They are merely testing your ingenuity and fortitude. Google was created for a reason! It has almost all the answers to all the questions and the how toe that will save you from feeling and looking like an idiot in front of your boss, if you were to ask him/her. If Google doesn’t have the answer, turn to a friend or call your parents. I’m telling you, one of these three valuable sources will have an answer that will make you look like you’ve got yourself together. Try to figure it out for yourself and I mean, really try. Spend more than five minutes. Use those investigative skills you developed stalking your ex or figuring out how much a trip to the beach on spring break would cost per person, per room,per day if you left at X time instead of Y time. You get my point. Put a little effort into this and you’ll be glad you did. It not only makes you look good when you find the answer but it makes you feel good knowing that you did it on your own. At least it should. If it doesn’t, then you may want to think about asking yourself if you’ve taken too many of the easy way outs in your life. After researching on your own, if there are still some questions you simply couldn’t get answers for, create a list to bring in to your boss. This will show your ability to problem solve and that you’re sensitive of their time. If the requirements of a task or project aren’t clear, ask for more details at the time the project is given to you. If the task is deliberately open-ended in order to give you a chance to learn and show initiative, make sure you have all the information and resources you need before starting, and don’t be afraid to ask for help or advice, if it is truly needed. Don’t pretend you know something you don’t when an important task is on the line. Generally, when you are assigned any task- you are working under a time constraint. You can’t afford to mess up the work by assuming things or misinterpreting the instructions given. If you don’t understand the task you’re being assigned, ask for clarity rather than blunder on and risk disaster. Accept that you may make mistakes and own up to them. It’s ok. We all do things wrong sometimes. But red marks are dispensed when you discover that an intern didn’t ask for help and tried to cover their tracks after screwing up. Don’t lie. Own it. Trust me – honesty goes a long way too. Just remember: Ask for clarification of the project in the beginning if you don’t understand the instructions completely. However, if you run into something that you think could be answered by using your old friend Señor Google – try it before asking for help. Many times, interns are sent home because of what they’re wearing. Be cautious of what you’re wearing. You’ve heard it before — dress for the job you want, not the job you have. Dressing like you’re going to the nightclub in the morning is a no-no. Would you wear that outfit to church? Didn’t think so… leave it for Saturday night out. While some offices celebrate Casual Summer or Casual Friday, interns still need to dress professionally, especially if they’re going to be interacting with clients and high-level staff. 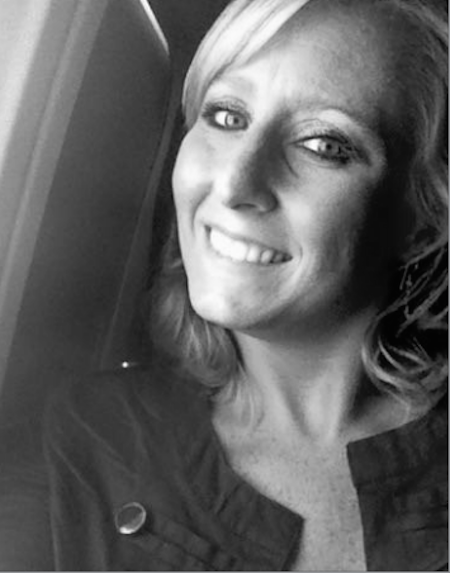 The way that you dress is a reflection of how you perceive the company you’re working for. Even if the place you work at is really laid back, showing up in tattered jeans and slippers isn’t acceptable. And please… watch how much skin you show (men or women). Wear an solid white shirt underneath your dress shirt. The entire office doesn’t want to see the logo from your last frat party or those “Must be this tall to ride” type slogans that your peers might find funny. Make sure you wear socks with your loafers or boat shoes. I know that the sock-less look is fashionable these days. In fact, I recently instructed my significant other to leave off the socks. However, he was not going to work nor was he an intern. Just put on socks! And Hipsters, those socks better not have pictures on them! Don’t forget the razor. No-Shave November? Not for you! If you had a beard or goatee when you were hired, then by all means keep it. Just keep it under control. 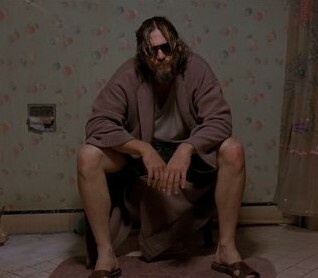 No one wants the intern who reminds them of the Unabomber or Grizzly Adams! If you were hired with a clean-shaven look – maintain it throughout your internship. Invest in an iron or budget for a weekly visit to the dry cleaners. You do not want to show up in a wrinkled shirt or khakis. Period. No hats of any kind. That includes ball caps, fedoras, sombreros, stocking caps, bandanas, and the like. You would think this would be a given. Unfortunately, it isn’t. Everyday is a shower day! Everyday is a day for deodorant. Use a brush, every day. Again – unfortunately this is not a given. You wouldn’t believe the stories I could tell. Don’t be one of those stories. 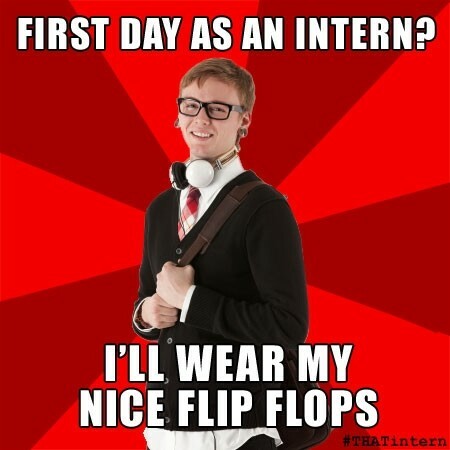 #smellyintern, #lazyintern, #hungoverintern are not hashtags of admiration. Check the length of your skirt before you leave the house by bending over and petting your napping pup or touching your toes. If you don’t think your father would approve of the “behind” view, then either put on a pair of leggings or change outfits. A good rule of thumb is to make sure that when your arms are held at your side, the skirt is at least in inch longer than your fingertips. In most cases, this is accurate and acceptable. However, some people have long legs and short arms. If you are one of them and still aren’t sure about the length of your skirt – change it. You are going to want to learn the art of wearing a tank top underneath your shirt if you are used to wearing low cut blouses or button-up shirts that don’t quite button around the chest area. This is a problem many of us have. Those all-important third and fourth buttons strain to break free and sometimes we can get away with just leaving them unbuttoned. Don’t try this at your internship. Put a tank under it and voila – tacky to work-trendy. No skin tight clothes. I don’t care how cute it is or if its the latest fashion. Save it. This goes for jeans, pants, skirts, and shirts! Invest in cute cardigans. These are lifesavers for fashionable women, especially during the summer. Take those cute summer dresses – you know, the ones with the spaghetti straps – and put a cardigan over it. This instantly gives you twice the number of potential work appropriate outfits without spending a ton of money AND you can easily lose the cardigan on the hot drive home or when you meet your friends for happy hour! Keep the makeup and accessories to a minimum or at least keep them modest. Don’t rock the full-on glam eyeshadow at work and save the 3inch dangle earrings for going out with your friends. Remember – keep it professional. Unless of course, you are interning in the fashion world. Then – throw out everything I have said and glam it up! Wear a bra. No – the shelf bra in that tank top doesn’t count nor does scotch tapes on your tatas! Enough said and I really shouldn’t have had to say that much! Many companies – especially in the south – are still run by older generations of men who think certain ways about clothing and styles. You may disagree but as long as you need a paycheck, or in this case an internship, and they are offering you one, dress the way they would want you to dress. That said, don’t rock a full-on suit and tie if everyone in your office is wearing jeans. On your first day of work, dress on the conservative side. Then check out what your coworkers are wearing and use that standard to judge the rest of your outfits. You don’t have to wear your Sunday’s best if that’s not the culture of your workplace, but you should be mirroring the best dressed employees in the company. If your closet is filled with tank tops, low cut shirts, flip flops, micro-minis, frat/sorority tees, hipster jeans, distressed jeans, 4 inch heels, yoga pants, sweatshirts, and a whole lot of “i’m in my 20s” clothing then tell mom to send you money, and visit one of the many clothing stores around town or raid a friend’s closet until you can make enough money to purchase some key pieces for your internship. No shorts, no flip-flips. Pretend it’s a real job, even if it isn’t. Yet. In last month’s edition of 20 Ways to Not be #ThatIntern, Number 16, Keep it to Yourself – Online and Off, talked about the importance of Social Media and how it is certainly used in everyday life. How a Facebook, Twitter, and LinkedIn account will help you build your online presence, but that it could hurt you in the real world. We advised you to remember that what you put online will be exposed to everyone, so be sure to ask yourself if it would be a good idea to put whatever it may be online and for the love of kittens – how you should under no circumstances post any potentially questionable pictures. STAY OFF YOUR SMARTPHONE AT WORK! These days everyone is glued to their smartphones. There’s nothing more annoying than a smartphone that’s always going off in the workplace. Make sure your phone is on silent (that means vibrate is off too). Keep your phone in your pocket until there’s an acceptable time to check it. Try to limit yourself to a few times a day. Yes, occasionally checking your Facebook feed is fine – ONLY if you have taken care of everything you were tasked to do or if your superior is in the bathroom. However, if they are in your office – Don’t even think about touching that phone to answer a text, check your news feed or send a SnapChat. Your employer doesn’t care that everyone is doing it. Even I, an avid face-booker, text-er, and all-around social media maniac, gets perturbed when someone is always looking at their phone. Especially when they have work they could be doing. See Number 14 if you think there isn’t anything for you to do. Don’t make personal calls. Don’t text. Don’t surf the web. In fact, you should just put your phone away during the workday so you’re not tempted to use it if you have problems with limitations. That’s all for this month’s edition. Stay tuned for #9 through #5. Come back next month to learn 5 more ways to NOT be #ThatIntern.